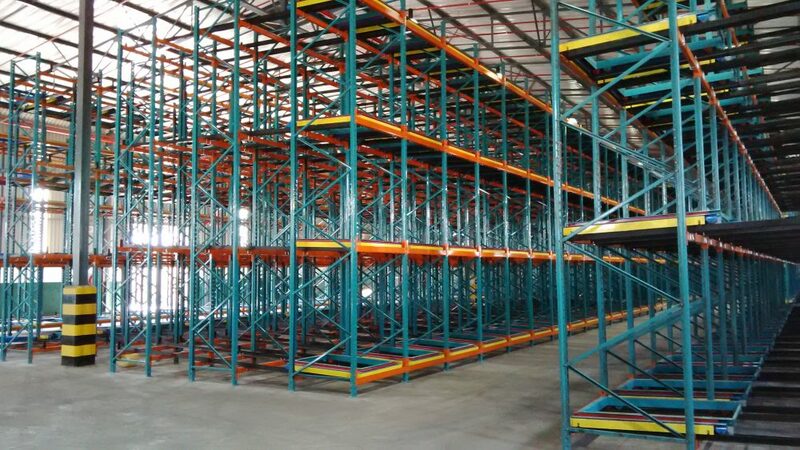 Organize your storage space by depth rather than width and increase storage density with Universal's Pushback Pallet Racking concept. 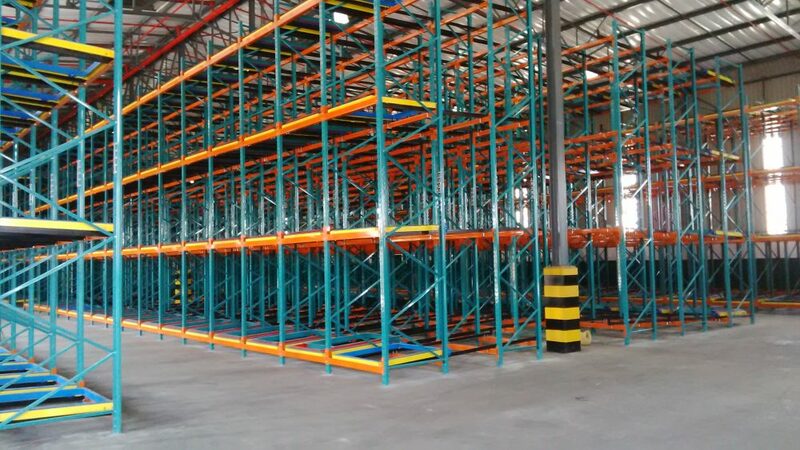 Pushback pallet racking is an accumulative storage system that facilitates storage of up to 5-pallets deep per level. 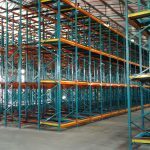 They are high density storage systems that increase pick rates and offer up to 90% more storage than selective rack systems. 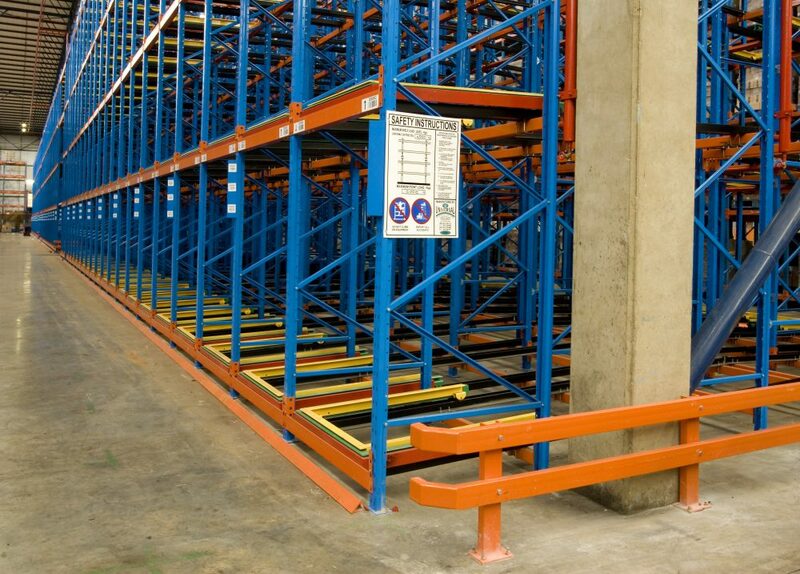 Pushback racking systems make optimal use of available space by stacking pallets on top of each other. Except for the pallet on the top level, all other pallets are placed on a set of trolleys, which are pushed along rolling rails. When one pallet is removed, the next simply rolls to The front for easy removal. 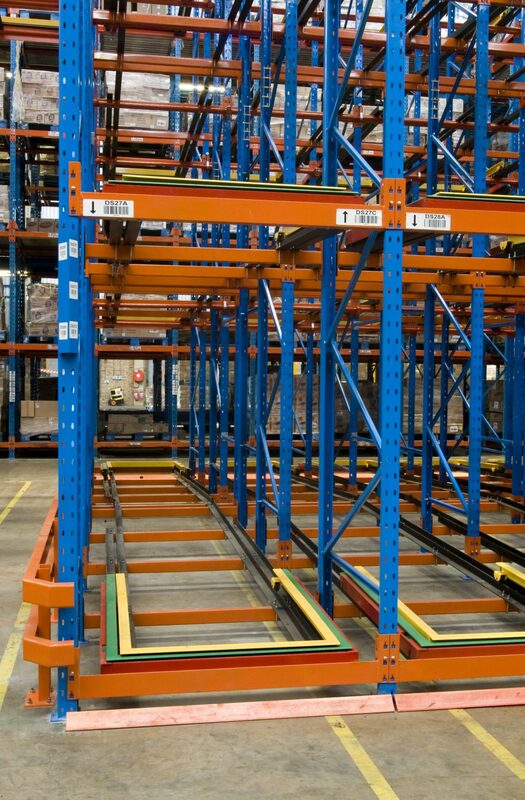 The interlocking carts help to minimize costly product damage or jamming, and because each level is independently accessible, different goods can. 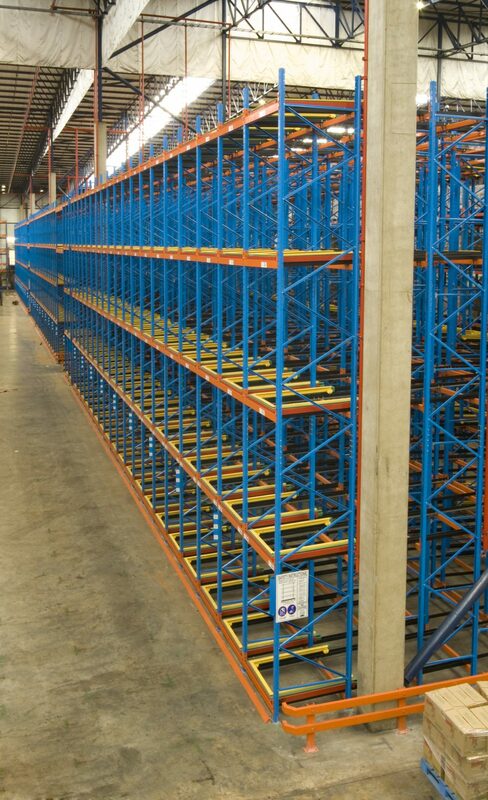 Pushback pallet racking is ideal for products that have an average stock holding of 4-5 pallets, and as such, is often used by smaller cold storage operations. They’re also favored by operations where the FIFO method of goods retrieval is not required. 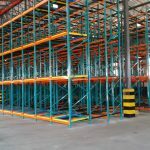 The concept of push-back racking is not a new concept and there are various different designs in the market to choose from. It consists of a set of interlinking trolleys that run on an inclined track within a rack. The first pallet is placed on the first trolley. The forklift operator then uses the second pallet to push back the first pallet and trolley in order to expose the second trolley for placement of the second pallet. This process is repeated until the lane is full with the last pallet placed on the rails and not on a trolley because it does not need to move. Depending on the design, lane depths range between 2 and 5 pallets deep. Removing the pallets starts with the lifting of the last pallet that was placed in the lane and moving back slowly in order to control the speed of the remaining pallets flowing forward. 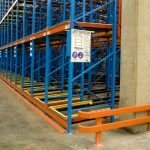 This controlled movement is necessary to prevent damages and accidents bearing in mind that you may have up to 5 pallets, each weighing 1000 kg, moving forward down the incline. 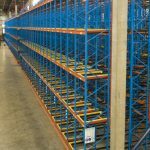 By storing pallets in a push-back system more pallets can be stored in a given area because of the reduced number of aisles required. i.e: 1 Aisle to service 10 pallets deep (5 Pallets on either side) in a push-back layout as opposed to 1 aisle to service 2 pallets deep in a normal static rack layout. 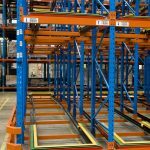 By using structural angle in the design of the Uni-Pushback system it is possible to reduce the overall height of the trolleys thereby reducing the overall height of the supporting rack. This could allow for a possible extra level of storage when compared to more bulky designs. The trolleys are designed to interlock with each other. This prevents the possibility of a trolley getting stuck at the back of the system and then release at a time when there is no control over its movement causing damage to the system and injury to personnel. Flanged wheels are used to keep the trolleys on track and reduce the amount of friction, allowing easier movement. The design of the track also prevents obstacles from blocking the path of the wheels.